Hear Upper Structure's EPIC Cover Of Imagine Dragons' "Believer"
Ladies and gentlemen, prepare yourselves for one truly EPIC video! 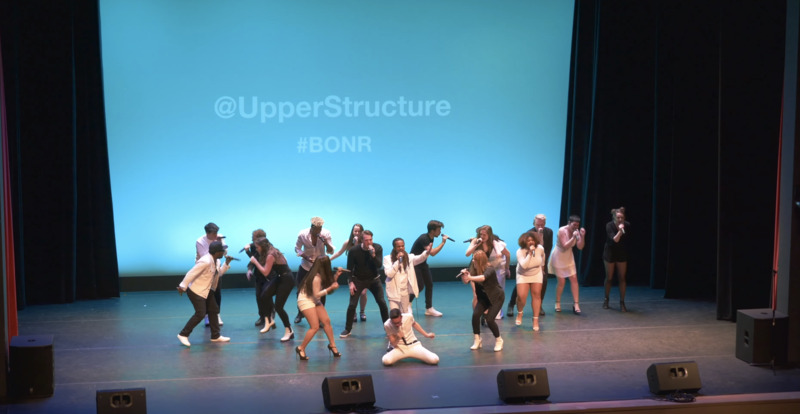 Berklee College of Music's very own Upper Structure has released one of the most jaw-dropping performances ever delivered in a cappella music. Straight from their BONR 2018 set comes perhaps the most electric Imagine Dragons' cover our ears have ever been graced with. And we're not just talking about vocal covers, we're talkin' all types of covers. The coed a cappella group has released a majestic display of vocal talent with their live performance of "Believer" that's ripe with crazy highs, stunning energy and one epic soloist. From the very beginning of the video, Upper Structure establishes a booming foundation full of incredible vocal effects held down wonderfully by the group's bass and percussionist. Under typical circumstances, vocal covers of Imagine Dragons' tracks tend to not come anywhere close to the charisma and level of production of the original tracks. But, Upper Structure has easily succeeded where others have failed. A lot of the credit goes to the creative nature of the arrangement, which is full of wonderful layering. An equal amount of accolades has to go to the vocal talents of Upper Structure for pulling off such a complex arrangement and executing it with limitless energy. And if we're being honest, major props are in order for Upper Structure's show stealing lead Bryce Mathyer. Mathyer owns the lead from top to bottom with his insane range that's powerful and commanding. While his range is impressive, it is his stage presence that has us in awe. Mathyer singing "Believer" is quite possibly the most exciting show you're bound to see in all a cappella. There's no need to wait any longer. Click the play button below NOW!